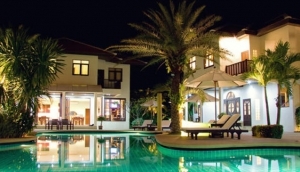 The latest trend of hiring a private villa for your holiday has become an attractive option on Samui. Private villas, in secluded surrounds, on beachfronts, offer a romantic or family retreat with all the facilities and amenities of a resort. Koh Samui's tourist hubs are quite busy and have a large variety of resort and hotel style accommodation. Samui has so some much more to offer and for those that would prefer to take advantage of seclusion, privacy, with less crowded beaches, fantastic views. Samui now has a great variety of modern luxurious villas for couples, groups or families to enjoy a private getaway with all the attention and service you'd expect from a a 5 star resort. It's not only high-end offerings, there are private villa options for most budgets. See our list of offerings here.